Officials in Oklahoma claim to have halted the first attempt in the state to smuggle contraband into a prison with an unmanned aerial vehicle. A drone hauling mobile phones, drugs, hacksaw blades and other items--all of which were hanging in a bundle from a fishing line--crashed at the Oklahoma State Penitentiary before prisoners could grab anything, officials announced on Tuesday. The drone is said to have run into razor wire on prison walls, mid-flight on Monday. Its operator lost control of the UAV, and the drone crashed into prison grounds. It's a story that will no doubt be advantageous for lawmakers pushing for strict drone regulations around the country. At approximately 9 a.m. on duty staff noticed a UAV lying upside down on facility grounds. After making contact with the shift supervisor, it had been determined the UAV had hit the razor wire upon its ascent, causing it to lose control resulting in a crash. According to security at the facility, the package containing the contraband was suspended under the drone with fishing line. The package contained: two – 12 inch hacksaw blades, a cellphone, a cellphone battery, a hands-free device, two packages of Newport Cigarettes, two packages of Black & Mild cigars, two tubes of super glue, a 5.3 ounce bag containing marijuana, a 0.8 ounce bag containing methamphetamine and a bag containing less than 1 gram of heroin. 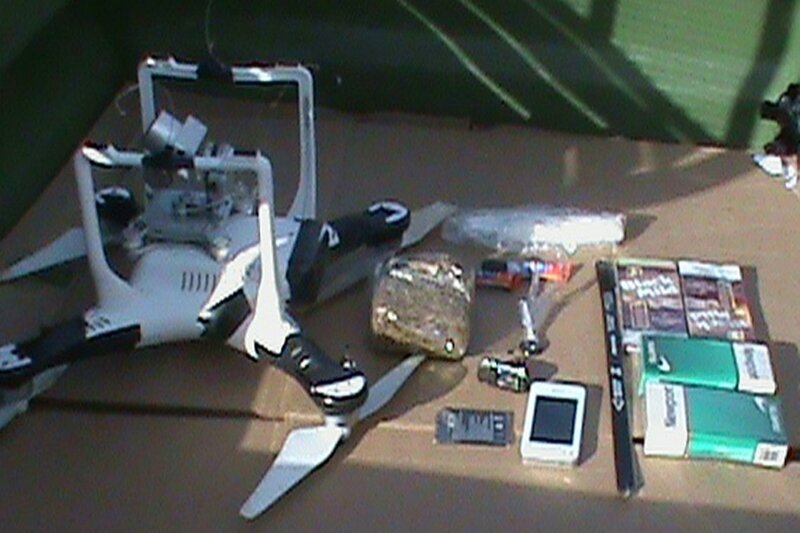 Today’s attempt to smuggle contraband into a facility via UAV is the first reported incident of its kind in the state.